March 19, 2019, 11:02 a.m.
By Nicholas Quah March 19, 2019, 11:02 a.m. Welcome to Hot Pod, a newsletter about podcasts. This is issue 200, published March 19, 2019. Issue 200. Crazy, huh? Look, I’ve never held a proper job for more than nine months, and so it’s more surprising to me than to anyone else that I’ve sent out two hundred of these comically lengthy newsletters for a living. (And that doesn’t even count all the Insider and emergency issues.) Running this thing is hard, hard work — there hasn’t been a second when I’m not thinking about the newsletter since the first issue went out way back in November 2014 — but it’s been a really rewarding experience, and the fact never escapes me that it’s a privilege to serve this readership every week. So thanks for being a reader — and to the Insider subscribers, thanks for helping to keep the lights on. While we’re here: I made two media appearances last week where I had the opportunity to talk through bigger-picture stuff: CNN’s Reliable Sources podcast with Brian Stelter, and The Colin McEnroe Show on Connecticut Public Radio. Also, in a nice bit of timing: New York magazine is running a big package this week on podcasts, which includes features, infographics, and a big fat list that’ll trickle out over the next few days. Check it out. Okay, let’s move on. We’ve got to talk about labor. The union push at Gimlet. In case you missed the emergency drop, last Wednesday, a consortium of employees within Gimlet Media’s 80-person-plus creative workforce announced that they are unionizing with the Writers’ Guild of America, East. BuzzFeed News’ Caroline O’Donovan had the original story up that morning. Issues that the union hopes to focus on include, but are not limited to: “consistent and transparent job descriptions and salary bands,” “clear and fair policies around contractor employment,” “equitable processes for protecting employees’ intellectual property,” and “employee input in company decision-making.” You can find the full list in the union’s official announcement statement. 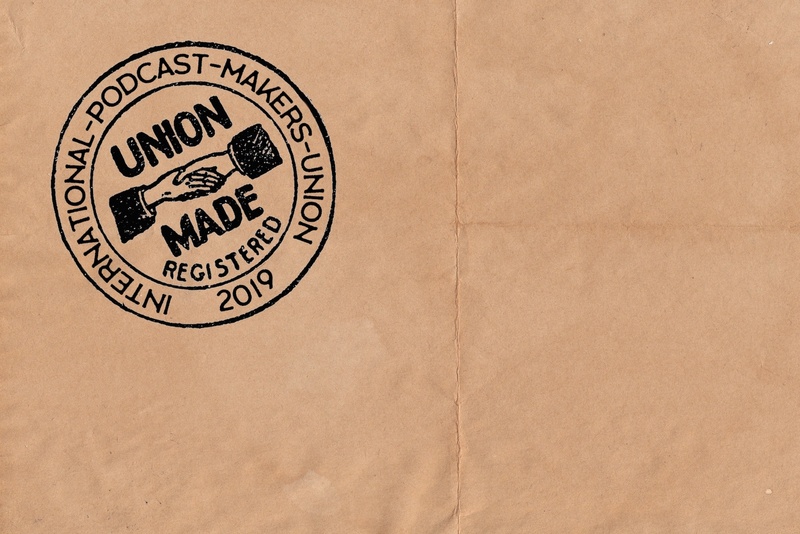 According to that announcement (posted March 13), the union is a coalition of producers, engineers, hosts, editors, and reporters. Sales, marketing, and management staff aren’t included. O’Donovan reports that 75 percent of Gimlet employees have signed union cards in support of the push. Rachel Ward, a member of the union organizing committee, told me last week that efforts began in earnest around November but were briefly put on pause when the committee learned about the possibility of a Spotify acquisition. Now that the acquisition has been completed, those efforts have resumed, with a formal recognition request sent to management last Monday. Ward also noted the push to unionize is largely motivated by a desire to develop a formal system of protection and collective bargaining, not specific complaints about management. They are currently hoping for voluntary recognition; whether or not that happens is, obviously, the next thing we’ll be watching out for. This development is historically significant in two ways. First, Gimlet is the very first podcast-specific company to undergo this process. That isn’t to say, by the way, that the Gimlet workforce will include the first podcast workers to unionize — I imagine some folks at NPR and WNYC, both SAG-AFTRA shops, would have something to say about that. But by being the first pure podcast shop to unionize, the Gimlet union and WGAE are going to be doing a lot of work from the ground up. Quick gut check: So, it occurs to me that unions in America are tricky things to talk about. The topic engenders tremendous emotion in all directions for a myriad of historical and political reasons. Nevertheless, it’s worth being hands-on with this story, as it may become increasingly important over time. I’m no expert in the subject, and I realize I’m wading into a generations-old debate that smolders with ancient fury, but I reckon that since we may be tracking this story over the longer term, I owe it to you to be transparent and lay out how I’m processing things. Feel free to disabuse me of any notions wherever you see fit. Also, to my European readers: Yes, I know this is a very American story — but what can I say, some of us don’t live in places with strong traditions of, uh, structural worker empowerment. First things first. It would be imprecise, in my view, to interpret this organizing campaign as a consortium of Gimlet workers seeking targeted remedies for specific problems or structural inequalities (e.g. a system of “perma-lancers,” etc.) that company leadership had persistently failed to solve. It’s my understanding that Gimlet generally delivers above-average conditions and policies to its workers, and that it will continue to do so under the governance of its new Swedish overlords at Spotify. Plus, as Ward told me, Gimlet management has been fairly responsive to change requests in the past, having moved quickly on things like reducing dependency on less-protected contractors. There’s also a concern around compensation flattening as it pertains to media businesses built in some part on “stars” — in this case, hosts and senior creatives of the more successful properties within the show portfolio. A quote from a publishing executive in a 2018 Digiday article on digital media unions embodies an argument I’ve heard quite a bit over the past week: “It helped raise the floor, but it flattens the compensation structure…for the star performers, there’s less money to reward them for doing well.” I imagine your mileage on this may vary based on whether your experience level, specific value to the company you work for, and the extent to which you believe a negotiation can result in a situation in which the floor is raised without compromising the ceiling. In any case, this is one of those things that can split union members apart. That leads us to an issue often raised about the impact of union organizing on morale: the notion that unions cultivate an “us vs. them” mentality, leading to rifts in the relationship between staffers and management — or even within the workforce itself, as the process sometimes pits those who want to be in a union against those more circumspect. Again, your mileage on this may vary, and I imagine much of it depends on the specific dynamics of the workforce and its particular union-building journey. With all that laid down, here’s the thing I’m keeping top of mind: The process of successfully forming a union that works can be incredibly difficult. It takes building a strong coalition of workers (never straightforward even in the best of times; see: electoral politics); an organizing committee and an external union body that’s able to really understand, account for, and balance all the different needs of every subgroup within the coalition (therein lies the pure politics, as one could argue that, say, a big-time host or an union rep used to handling magazine writers might not fully grasp the needs of more junior audio producers, branded content workers, and veteran journalists); and the ability to develop actual leverage and political capital for effectively negotiating good concessions from management. Also, unions are complicated. Some treat their members well, others might not — it all depends on the nature of the people running the show. In any case, any single bad example of a union shouldn’t invalidate the value of unions as a structure, in perhaps much the same way one bad hospital shouldn’t invalidate hospitals as a system. Anyway, even if Gimlet management does voluntarily recognize the union, remember it’s only the beginning of a process. It can take a long time — years, even — to arrive at a collective bargaining agreement, and pursuing that outcome while preserving the coalition can be a bruising experience. Also, Gimlet is a remarkably peculiar company. Not just in terms of the whole Spotify ownership aspect of things (though there’s definitely that), but also for the fact that it’s a company whose workforce grew really, really quickly in large part due to venture capital and whose ranks appear to practice some fluidity with the divide between those who work on editorial and those who work on the advertising/branded content side. That divide matters more to some shops than others; it’s unclear to me to how it lands on the Gimlet workforce at this point in time. Shouts to Gritty, patron saint of workers everywhere. Burnout reader survey [by Caroline Crampton]. I’m revisiting this subject one more time, in part because it’s an important and substantially complicated topic, but also in part because it feels really meaningful to a good portion of the Hot Pod readership. Last week, I directed readers to a survey I’d put together to collect feelings and information about this topic that allowed people to stay anonymous. Hundreds and hundreds of you took the time to fill it out, and I’ll spend this week digging through some of what popped up in the responses. Unsurprisingly, an overwhelming 83 percent of those who wrote in said that they’d experienced burnout — again, a self-selecting sample, but still a lot higher than I was expecting. Others wrote in that they weren’t burnt out now, but they felt like it was on the horizon. 71 percent of respondents cited both “too much work” and “personal ambitions/standards” as burnout triggers, with 61 percent pointing to “juggling non-podcast work” and 49 percent an “unrealistic release schedule.” I was surprised to see that “network/advertiser demands” wasn’t much of an issue for most, with only 8 percent pointing to that as a factor in their burnout experience. This makes more sense in the context of the kind of work respondents were doing — 87 percent say they are podcast producers, and 41 percent of those work independently, so commercial considerations are most likely either not relevant or else not a major day-to-day factor. Only 35 percent of those who took the survey are doing work that is supported by advertisers, with a further 12 percent working for public radio outlets. In addition, 51 percent of respondents said that they don’t make the majority of their income from podcasting. I found this enlightening. I’m a reporter who often produces audio professionally and/or commercially, and so I forget sometimes that people like me only make up a small slice of podcasting as a whole. Burnout extends way beyond just those who make podcasts as a job or for money; it applies to people who started their show as a hobby, a side hustle, or as an add-on to an existing business, many of whom are finding that the medium can push them into unhealthy practices or places. A big part of burnout seems tied to release schedules. Only 30 percent of respondents are putting out work in seasons, and 49 percent are publishing an episode every week. That’s a lot of audio for anyone, and particularly those for whom podcasting isn’t their main job. In longer interviews I’ve done around this topic (part one and part two), that’s comes up a lot. Several people mentioned transitioning from a regular weekly release schedule to a periodic, season-based approach as a way to manage their feelings of burnout; getting off the weekly production cycle relieved a lot of the pressure. I still think something’s missing here, because monetization options (both advertising and crowdfunding) are skewed towards regular, ongoing publication, but I’d suspect that we’ll see more hobby and independent podcasters take this approach in future. A lot of people are worried that the world will stop turning if they don’t release a podcast on a regular, never-ending schedule. Feeling shackled to an unrealistic publication schedule seems to be one of the biggest podcasting-specific burnout triggers. I’m guilty of this myself; when I produce shows for other people, I recommend they work on seasons in batches and release them with gaps in between for feedback, vacations, and development. But the podcast I make independently by myself on the side of my other work comes out every other Wednesday, rain or shine, and I frequently work late into the night or on weekends to make that the case. Like a lot of people who have been around podcasting for a while now (17 percent of respondents said they had been involved in audio for 7 or more years), I understand that the way people listen to podcasts has changed since I made my first one in 2011 and that there are plenty of benefits to a non-regular release schedule — but I can’t shake the deep-seated belief that regular publication is the only way to build an audience. One for me to work on, definitely. Then there’s this issue of personal ambitions and standards. It blows my mind that so many respondents cited their own internal standards as one of the biggest factors in their burnout, not anything external. Such feelings can be a good motivator, but among other stresses, they can also turn destructive. Knowing when to let things go, or when to reduce your output so you can keep the quality where you want it, is a vital skill we should all be talking more about. Finally, there’s the silence that largely surrounds this issue. I’ve had so many messages in the past few weeks from people who just wanted to say that they appreciated seeing it discussed in public at all. Even if someone isn’t ready to talk publicly or even anonymously about their burnout (and it’s fine if they never want to do that, of course), it’s helpful to read about the experiences of others and feel like you aren’t going through something unusual. So, the final thing I’ve learned here: Let’s all talk about what’s going on here a bit more, whether online or offline. You are most definitely not alone. Career spotlight. It’s been a while, but this feature is finally back. I continue to really enjoy publishing these snapshots; even as this industry grows bigger and more complicated and more curious, it’s still a community of individuals — and groups of individuals — trying to do stuff and make a buck. Anyway, I’m not sure if this is going to be a monthly or bi-weekly feature; I guess it depends on the news pace moving forward. Let me know what you think. This week, I traded emails with Amanda McLoughlin, the proprietor of an indie collective called Multitude. Amanda McLoughlin: I’m the creator and CEO of Multitude, an independent podcast collective and consultancy. The collective is five shows banding together to share resources: signing advertisers, booking live shows, and cross-promoting to one another’s audiences. Our shows feature enthusiastic hosts welcoming new people in to a subject they love — whether that’s mythology, basketball, Harry Potter, or Dungeons & Dragons. I handle those logistics, and each show is run and owned by its hosts. The consultancy is where we help our clients — anyone from indie producers to radio stations to companies wading into the audio world — make and market podcasts. We also publish a lot of free resources for podcasters on topics like production, marketing, and making money. McLoughlin: Podcasts helped me stay sane at a demanding but unfulfilling day job right out of college. By late 2015, I teamed up with my friends Julia Schifini and Eric Schneider to start Spirits. We learned a lot over our first year, and by that time, our other friends were getting into podcasting too. Eric Silver brought me on to an improvised roleplaying and storytelling podcast that he and his colleague Brandon Grugle were starting (Join the Party), and a friend from my vlogging days, Mike Schubert, was about to launch a show where he read Harry Potter for the first time (Potterless). We recommended each other’s shows to our audiences, shared tips, and pitched conferences together. By late 2017, we felt more like one podcasting family than separate shops doing their own thing, so I pitched the idea of a collective named Multitude (based off of a Walt Whitman poem — like most podcasters, I was an English major). The consultancy was born to address a gap I saw in the market for services to help podcasters grow and make money from their shows. There are a lot of individual producers for hire, and a lot of expensive branded-content studios, but not a lot of nimble full-service production companies in that vast middle ground — so I made one. That additional consulting income, combined with ad revenue and direct listener support on Patreon, let me quit my day job in September 2018. McLoughlin: Making my jobs work for me, not the other way around. I worked in theater, finance, education, and tech while I learned how to make podcasts. And each time I changed jobs, I looked for roles that would let me develop a new skill — not to be more marketable to future employers, but to become more useful to my creative collaborators. Each one of those moves felt like a compromise, and the mix of industries made my resumé look somewhat scattered. I felt like a wide-eyed freshman all over again when I had to learn about fundraising, accounting, teaching, and advertising on the fly, but I got good at them quickly enough to carve out my own time. I dedicated some time each workday to learn: taking advantage of an e-learning platform one company subscribed to, and auditing courses at another to learn accounting, business, and management. I had a lot of “please explain what your job is” coffees and sat in on the workshops I organized for the interns I was supervising. Ultimately, those skills are what equipped me to run my own company, and now, I am. There’s so much pressure on people in their 20s to become successful immediately. Lots of us feel like a failure for not finding a fabulous and fulfilling job right out of college — but that’s not actually possible for most of us. Ira Glass wasn’t good at radio while working full-time in radio for, like, eight years! Jobs that support you through that long of a learning curve don’t exist anymore. Instead, most of us have to support ourselves as we get good at what we want to do. And there is absolutely no shame in paying your bills with unglamorous or unfulfilling jobs while you try and fail and slowly get better at your art. Hot Pod: When you started out being an adult, what did you think you wanted to do? Hot Pod: What’s your take on where podcasting is going, at this point in time? PRX and Google have opened up applications for the second round of the Google Podcasts Creator Program. Here’s the announcement post; the deadline is April 14. For more background on the program, check out this Q&A that Caroline Crampton did with PRX and Google chiefs last November. Maximum Fun has kicked off this year’s iteration of its annual fundraising drive! Slate’s Slow Burn won a National Magazine Award in the podcast category last week. The category finalists included OPB and Longreads’ Bundyville; the New Yorker Radio Hour’s “The Longest Distance Con” two-parter; and three episodes of Queerly Beloved. From the L.A. Times: “From its new $38-million home, can radio tastemaker KCRW adapt to a podcast world?” Los Angeles, of course, is also home to KPCC, another podcast agitator. Seems to me like a rivalry to watch. Also, I’ve been saying this in private a couple of times now, but I might as well say it out loud now: Is podcasting’s center of gravity is swinging westward these days? This is fascinating, but unsurprising. Also: mildly dystopian. From The Wall Street Journal: “When Corporate America Joins In the Podcast Craze, ‘It Gets Boring Fast. '” Do note that the story mostly tackles podcasts created for internal company communication — think of your standard corporate newsletter that floats about an organization letting its workers know about, oh you know, stuff. A quick shoutout to Lina Misitzis, the great producer who most recently worked on Jon Ronson’s audio projects The Butterfly Effect and The Last Days of August (both for Audible). She’s now at This American Life. From the BBC: “MySpace admits losing 12 years’ worth of music uploads.” Yikes. Remember that all things can be lost, even on the internet. POSTED March 19, 2019, 11:02 a.m.
Quah, Nicholas. "Look for the union label (it’s coming to a podcast company near you)." Nieman Journalism Lab. Nieman Foundation for Journalism at Harvard, 19 Mar. 2019. Web. 24 Apr. 2019. Quah, Nicholas. "Look for the union label (it’s coming to a podcast company near you)." Nieman Journalism Lab. Last modified March 19, 2019. Accessed April 24, 2019. https://www.niemanlab.org/2019/03/look-for-the-union-label-its-coming-to-a-podcast-company-near-you/.